Training Tips: What are you looking for when training? This is often the hardest thing to know or be aware of when you’re learning horsemanship…..what are you looking for when playing/training/riding? To have an end result or goal is one way of looking at it, but another way is to use the training techniques to achieve something far more important….a well balanced horse….physically, mentally AND emotionally. 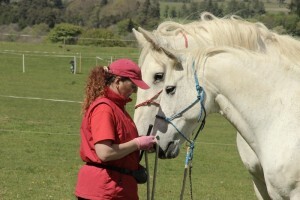 My main aim when working with a horse is first and foremost for the horse to be RELAXED. Calmness helps find curiosity and with those two things the horse is very teachable because he/she can take things in well and remember good experiences. If the horse is worried or fearful he/she will also be bracey in it’s body and mind and won’t remember anything good apart from how it felt when something was being done to it so relaxation is my first and last criteria of any session. To see relaxation in the horse we also see confidence and rhythm in it’s paces, these two are missing with a fearful horse. 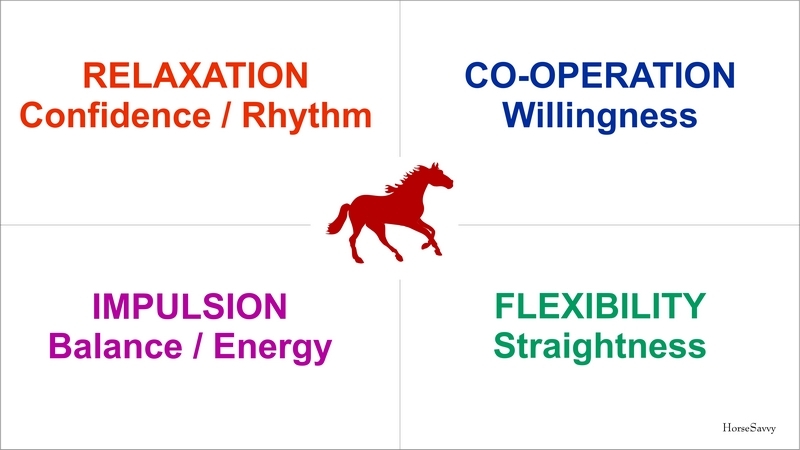 The next criteria on my list is COOPERATION, which is shown through the horse being willing to accept my requests and to enjoy interacting with me. 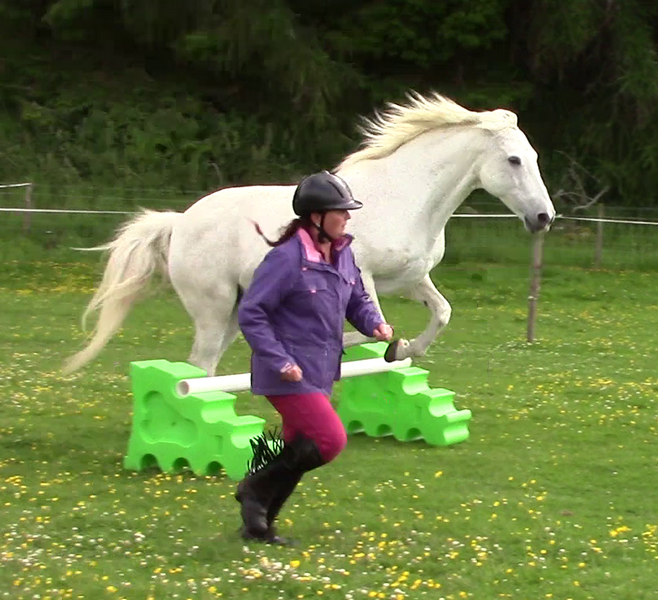 My third criteria when working with a horse is IMPULSION. This isn’t impulsiveness and doesn’t mean the horse runs around without stopping, it means the horse has the same amount of whoa and go, that it can stop lightly and nicely just as easily as it goes forward in any gait and is all about balance. 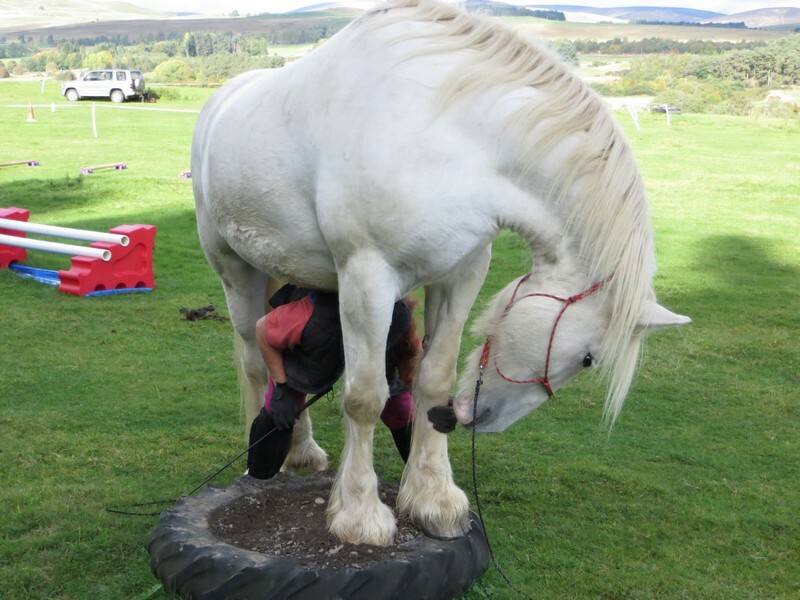 When the balance of whoa and go are good then you’ll see the horse be more balanced in it’s own body, it’s core will be more engaged and so will his hindquarters. 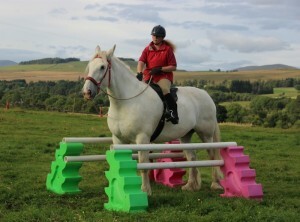 This is pure athletic energy that allows the horse to go or stop with a whisper. And my last criteria is FLEXIBILITY and this means that the horse is equal on it’s left and right sides and is as symmetrical as possible. 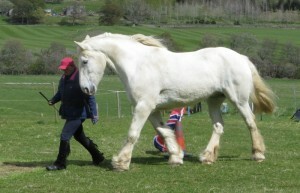 This way the horse can go in a straight line without the reins holding it in place. All horses (and humans) are born A-symmetrical and we all need working on to help become more symmetrical. Once we’re more symmetrical we’re straighter and our aids become lighter, our reins can be lighter and not have to be used for keeping the horse straight and we can start to ride the dance of horsemanship. While working through the HS Criteria list I often go back to RELAXATION when a horse needs me to help find that, this is the most important of all the criteria as without this one ingredient good learning doesn’t occur SO make sure it’s there at the beginning of the session and at the end. 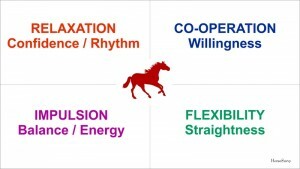 I also move around working on one or more of the criteria using my Horsemanship Techniques and work out what each horse needs on each particular day. A horse that is fearful may just need calming to find that relaxation with me from the start. A horse that is more of an alpha may need me to help it find relaxation and willingness when playing with some techniques. Some horses may need to be working more on willingness and impulsion and others may need lots of flexibility play whilst still trying to find relaxation. 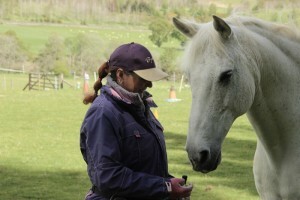 So, each time I handle a horse I am thinking of what the horse needs at that moment, what it needs to progress and what the owner wants to learn or where it’s training is leading to. Having the criteria to make sure whatever I do helps keeps the horse RELAXED, WILLING, FLEXIBLE with balanced IMPULSION is the key to progressing without any brace…brace in it’s body, brace in it’s mind or brace emotionally. Learning should always be done through relaxation, confidence, curiosity and FUN. You may have heard about ‘Comfort Zones’ and to get out of your own to progress, this is true but there is also more to it. To progress you need to step out of your comfort zone but if you step too far you may get worried, out of your depth or plain put off going there again SO here is a quick outline of how to progress without going too far. Here is a good image of your comfort zone, it has the learning zone just outside and the wilderness on the outer edge. 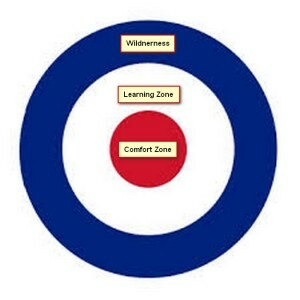 To learn anything you need to step out of and back into your comfort zone to the learning zone. Doing this often can help build your knowledge through consistency but you don’t want to go too far through that section or you could find yourself in the wilderness zone where you could end up lost and too scared to go out of your comfort zone again, sometimes for a while and sometimes forever, so just keep dipping in and out of the learning section. By stepping in and out of your comfort zone you will increase your confidence and build a solid foundation of knowledge which will increase the size of your comfort zone. 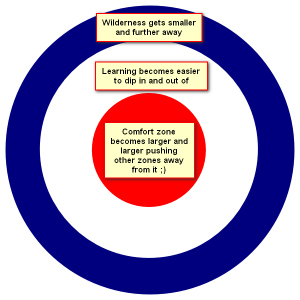 This then takes the learning zone further out so you have to go further for that but it also takes the wilderness zone miles away too. I call this approach and retreat with learning, keeping your CZ safe. 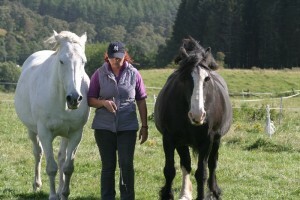 It’s accumulative learning and works not just for us but for our horses too. 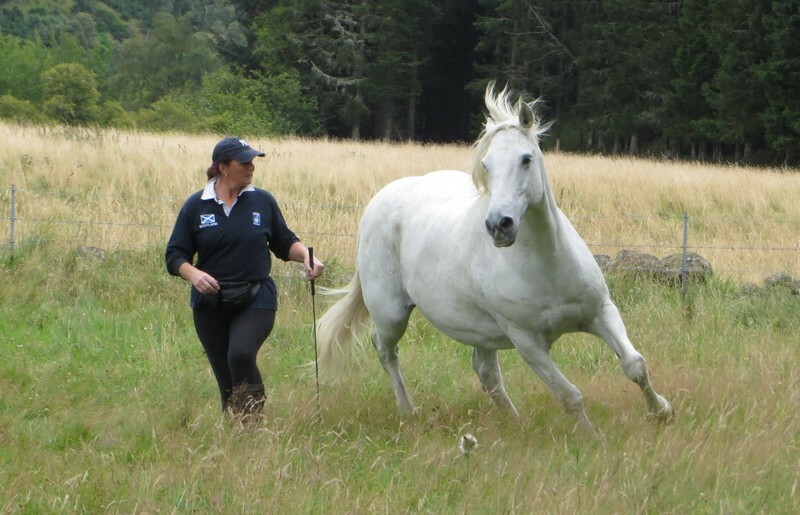 Approach and retreat with scary objects, new learning and building confidence and knowledge at our and our horses own rate keeps things safe and calm and good learning can only happen when those are in place. 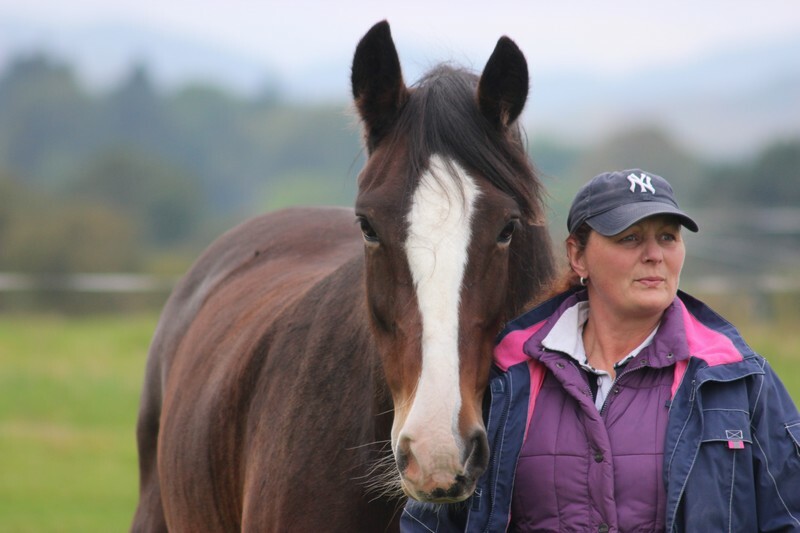 I have had many people asking how I get my horses SO in tune with me but I explain that it’s more of me being in tune with them first, then them getting in tune with me and then us having a mutually focused partnership through trust and respect. When I first started my journey into Natural Horsemanship my horse Tara and I had quite a good relationship, getting into the journey more and allowing my horse to have a ‘say’ about things that we did together brought around a turn of events that really foxed me and I didn’t know what to do. She decided that she really didn’t want to be around me (or any human really) and giving her the freedom to choose to run off whenever I asked her to be with me was a hard decision. I can understand why many people start Natural Horsemanship with this same intent only to be foxed like this and going back to their normal routine with the thought that NH had ruined their horse BUT I decided to figure out what Tara needed from me so that we could continue our journey and start that partnership that I always wanted. 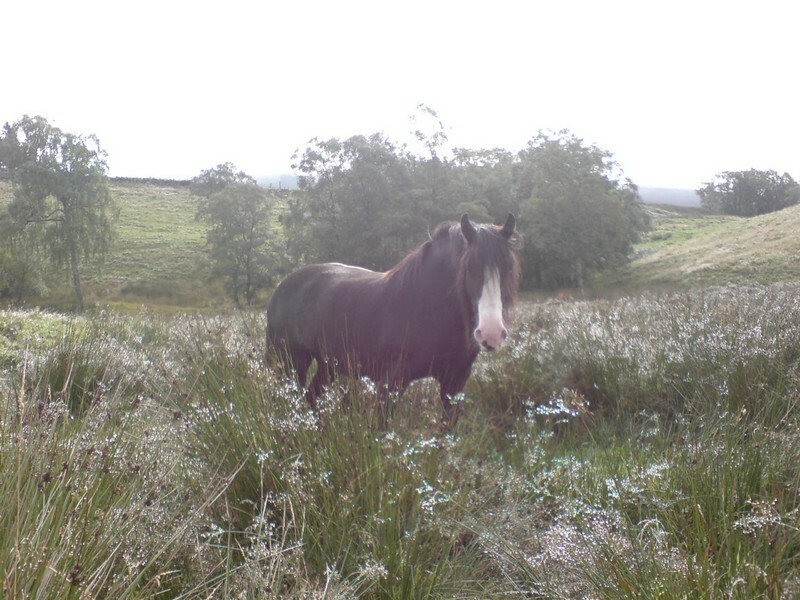 What I realised pretty quickly was that Tara was quite a shut down horse, quiet, calm, sensitive and did ‘as she was told’ because that’s the way she had been trained. Being such a sensitive soul she showed her ‘compliance’ by being obedient but not willing, by which I mean she did what I asked in a slow, bored way that made me work harder than her and if I really asked too much she went ‘blank’ or would try to run off, especially at liberty where the truth always comes out. So, after much thought I knew that I needed Tara to catch me in the field not the other way around. She was very good at being caught, standing still and freezing whilst I put the head collar on but if I asked her to catch me she’d run off and that wasn’t the partnership I wanted with my beauty. I woke up one day and had an idea…’I’m going to mirror her today and try to be with her in her world, show her that I can be there as a herd member and not just with her for training’. This decision helped me to realise that to have a partnership with my horse I needed to request things with a two way conversation rather than demand things and to see if I could gain willingness rather than servitude. So, I started off in the field about 50’ away from her (she turned her head away if I got any closer and I knew that was her cue for leaving), I started stepping as she stepped, turning when she turned and stopping when she stopped. After a few hours and lots of slow progress I was standing about 5’ away from her, taking each slow step with her as she grazed, putting weight on the back, front or side of my foot like she did as she slowly moved. I turned my head the way she did, lifted it when she did, started to see her muscles move in her legs, her chest move as she breathed. After another few hours we were very much in harmony, steps, moves, breathing and then about 5 hours into the experiment she stood for about half an hour totally still, almost asleep watching over the other three horses as they lay down to sleep. This part was hardest of all. I moved, brushed flies off me, scratched itches and generally not ‘in the moment’ with her at all. BUT I did start to realise this and managed to really become a sleeping horse with her, it was like meditating. In a HUGE moment she then lay down next to me and I sat down with her for another 15 mins. That moment will always be very special in my life as she showed me that to be in her world, on her time, with her peace she was willing to allow me in and showed me true trust by laying down with me. Since that moment Tara has always come to catch me but I have to ask her permission to enter her realm every time by squatting down when she looks at me and open my heart to shower her with thoughts of love and when I do that and open my arms to her she comes to me willingly on her terms. She has taught me patience I never knew I had and the awareness that if I allow things to happen through mutual respect and trust then it will happen, but I have to believe. It’s not just about what I want, it’s about what we want together, as partners. 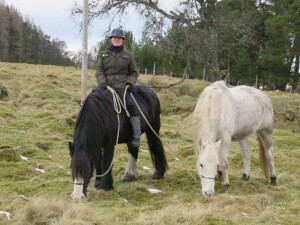 I also find that when I play the game of ‘Stick 2 Me’ that I can quickly get connected with her, and other horses, physically, mentally and emotionally because of the things I learned from those 6 hours one day on a Scottish hillside. So, if you ever have the time to dedicate to mirroring your horse and not put a time limit on it then I really believe you and your horse can find deep bond by doing this. I’ve done little bits of this with Tara now and then and have done similar, shorter versions of it with the other members of our herd. It really does help to teach about how a horse moves, watching what they do during a day and reminds me daily that when I play or ride them that I’m doing a lot more with them than they do themselves when left to their own devices in their herd so I try to mirror them a bit and see if they’ll mirror me in the start of our dance together and that then brings about the game I play called ‘Stick 2 Me’ which I will talk about in another article soon. You can also ‘Mirror Your Horse’ when riding. Make sure your horse is calm, remembers you are up on it’s back and not spooky before doing this, start in a small area like a round pen. Allow the horses movement to move your body in harmony with it’s own. Shoulders with shoulders, hips with hips. 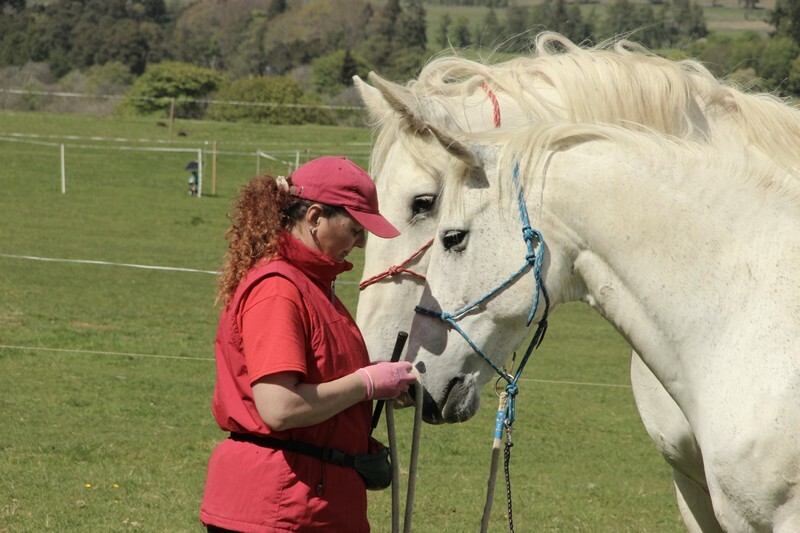 This task will find you a better seat and balance and allow you to not ‘be in control’ all the time, to allow the horse to have some say in your journey together. Friendship and partnerships are all about both sides having a say so enjoy learning how your horse moves and keep breathing in harmony too.